I hope that everyone is having a wonderful long holiday weekend and a very Happy Fourth of July. My family, friends, and I are looking forward to a great day of making memories, eating lots of delicious food, and treasuring this great country where we are so blessed to live. During my first blog, I gave you a short tour of my kitchen. Today, I’m sharing a more in depth tour called the “Summer Kitchen Tour.” My kitchen is mainly decorated in Farmhouse French Country. The kitchen is the most important room of our home. It’s not only where we eat, it is where we discuss the day’s issues, a gathering place for family and friends, and a homework spot. While I don’t do a total change up each season in my kitchen, I do like to add small touches that give a nod to the season. I usually add seasonal touches to my island and table coverings. In addition, I love to add seasonal flowers. I think I adore flowers as much as I do dishes. A few months ago, I decided to paint my kitchen island a french blue color. It was originally the same color as the other cabinets. I chose Benjamin Moore Province Blue. After the paint had cured, I applied a brown glaze to the piece to give it an “aged” look. For my Summer kitchen island vignette, I placed some blue and white pieces on a white platter and added fresh flowers to the vase. In the breakfast area, I added a blue and white tablecloth and an arrangement of red geraniums. The built in kitchen shelving usually stays the same. It houses my collection of red pottery along with some blue and white pottery pieces I have been collecting over time. I love farm animals, especially cows and chickens. The old cream bottle in the vignette comes from my grandparent’s dairy where my father grew up. Thanks so much for stopping by. I hope that you and your family have a very blessed and Happy Fourth of July!!! Hello Shannon, what a darling blog. Your summer kitchen look is so pretty. Love your collection and the built-ins. You certainly have brought some sunshine in. I am off to explore some more. I would love if you shared your lovely summer kitchen at Dishing It & Digging link party live now. It starts every Sunday 4:00 EST. Happy 4th! Linda, your comments were so sweet. Thank you so much!!! I went over and joined your party this morning. Thanks so much for inviting me, and I am so glad that you stopped by. I hope that you have a very Happy Fourth of July!!! Shannon, I love French country, too. I’m partial to blue also. Happy to meet you. Thanks for sharing at Your Inpsired Design Link Party. Carol, I’m so glad that you stopped by and that you love french country too!!! I hope that you have a very Happy Fourth of July!!! The blue painted island really sets off the wood cabinets. Thanks for stopping by and leaving a comment. I wouldn’t have found your lovely blog otherwise. Wondering if you would please show a closeup of the kitchen rugs? Pretty please??? Thank you so much for the kind comments. The rugs are on on JCPenney’s website. They are called Nourison Rooster Rug. I have had my since the Fall and love them. They are machine washable and hang dry which is great for the kitchen. It looks like they are having a sale today online. I hope this helps. If you need me to, I can email you a picture of mine. I agree…we need to know more about the beautiful red rugs!! I’m pretty much in love with your Frenchy farmhouse kitchen! The kitchen itself is really pretty but I also love the colors you’ve chosen and the accessories. It’s so welcoming! Stacey, thank you for the very kind and gracious comments. I’m so glad that you stopped by, and I hope that you have a wonderful day!!! CIndy, thank you for the very sweet and gracious comments. I’m so glad that you stopped by, and hope that you have a great Thursday and a wonderful weekend!!! Deanna, thank you for the kind comment. I’m so glad that you stopped by, and I hope that you have a wonderful day!!! Your French country kitchen is both beautiful and cozy. I love the blue and white pieces on the white tray (especially the flowers). Eilis, thank you so much for the very kind and gracious comments. I’m so glad that you stopped by, and I hope that you have a wonderful weekend!!! Shannon, your kitchen looks like a great place to spend time. I love that the stairs come into the kitchen. Do you have back stairs and front stairs or just these? Something about stairs entering into the kitchen make a home seem cozy to me. Your red, white, and blue details are great for celebrating patriotic spirit of summer holidays. Sarah, thank you so much for the very sweet comments. My stairs are only in the kitchen and lead to a bonus room. It is a large room that I have been working on. I shared last week the reading nook, and I’ll soon be able to share the television/sitting area and office space. I’m so glad that you stopped by, and I hope that you have a wonderful weekend!!! Beautiful kitchen with such pretty accessories. Love your style! Carol, I’m so flattered that you like my kitchen and my decorating style. Thanks again for stopping by!!! I could move right in! So lovely. I especially like the island and the way those rugs POP! The table is perfect–love the linens and slipcovers! And the “cattle art”–so fun. What a serene home! Thank you for the very sweet comments Lisa. I am so flattered that you like my kitchen. Thanks so much for stopping by and have a great weekend! I love the color of your island and all your pretty blue and white. Very pretty kitchen. Thank you so much for the very kind comments. I’m so glad that you like blue and white too. Thanks for stopping by and have a great weekend! Thank you so much Cindy and thanks for hosting!!! Your kitchen is lovely! I especially love the blue cabinets and the tablecloth. It looks so welcoming. Mrs. White, thank you for the very kind comments. I am so glad that you stopped by, and I hope that you have a wonderful day!!! Thank you Carol! I also love kitchens. I think it is my favorite part of the house. I’m so glad that you stopped by, and I hope that you have a great rest of your week! You have a beautiful kitchen! 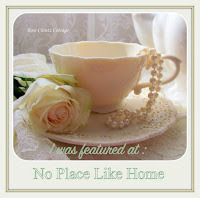 Thank you for sharing at Home Sweet Home! Thank you for the very sweet comment Sherry! I’m so glad that you stopped by!!! Shannon – Love your beautiful summer kitchen tour! Can you tell me where you found the cow picture/ print at? Hi Joanie! Thank you for the very kind comment. You may find this funny, but I found the cow picture at Buc-ee’s Store while traveling through Texas. We stopped to fuel up, and I went inside and was amazed at all the neat decor they have. Who would of thought it? We do not have any here in Oklahoma. I know they are all over Texas. I’m not sure where else they are located. I looked to see if they have an online store, but they don’t. I hope this helps. I’m so glad that you stopped by, and I hope that you have a great day!! !